There's an odd thing that has been happening at out little lake lately. When the wind blows, it has been accompanied by snapping and booming noises, and a sailor has to be towed in. A couple of weeks ago, Eric Aker was the victim with a mysteriously snapped mast. This week it was John Houstle's boom that made a noise like it's name. John was leading the race, when he was hit by a gust and went into a death roll, which became the death knell for his boom. John, Rick Schlosser and Mark Stoughton did battle not so much with each other, but with the shifty, oscillating southerly, then easterly, then southwesterly winds on the lake today. Race Strategy and tactics changed by the minute as the wind shifted. It wasn't the normal ADHD shifts that the lake normally has, it was more of a sinister south to east back to south oscillation, punctuated by occasional blasts from the southwest. Mark Stoughton took the first race, going to the left into more pressure after a shift in the last 30 seconds before the start eliminated the heavily favored port tack advantage that had persisted all during the course set up. Rick Schlosser took the second race after forcing Mark into a bad start and dominating the race from there. The third race provided an excellent demonstration of the "never give up" principle. Rick took the start, and the race seemed to be a replay of the second race, until Rick got hit by one of those dreaded blasts from the east that put him into irons at the mark. Both John and Mark passed him and rounded. John was leading by about 8 boat lengths midway through the downwind leg, when he too was hit by a gust, sending him onto a death roll that ended with his boom snapping. Mark said past him into first place. Rick Found a sustained puff on the downwind leg and made up almost all of the ground that he lost at the upwind mark, forcing and almost winning a battle with Mark on the last upwind leg. 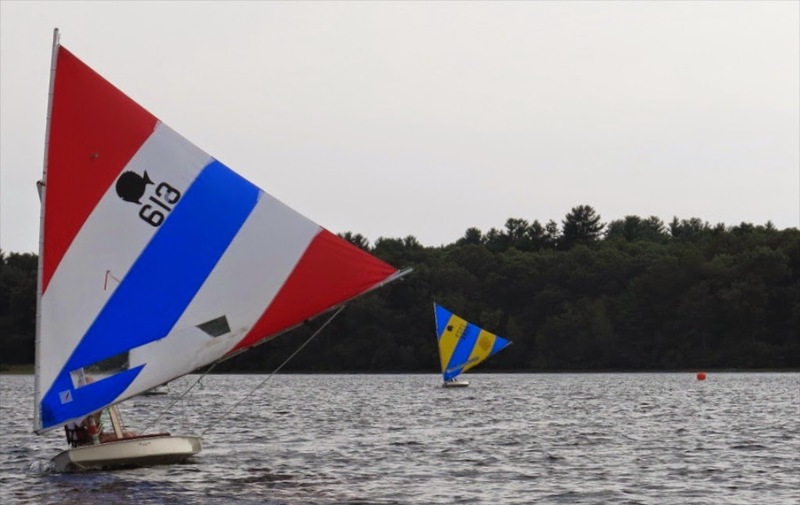 Don't forget, One week from today is the 65th Annual Massapoag Regatta! Hope to see you all there.